One of the most aggressive and visible of the cultic groups active in the world today, the Jehovah's Witness organization pursues its vision with an energetic tenacity that almost defies description. 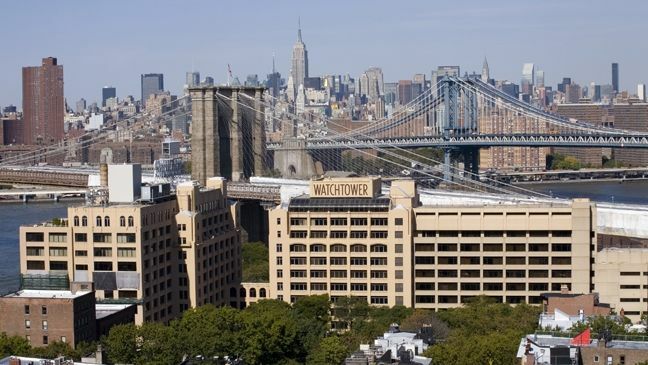 Headquartered in Brooklyn, New York, the Watchtower Bible And Tract Society, their "mother" organization wields enormous influence completely out of of proportion to its size, largely due to their dubious distinction of being the most prolific producers and distributors of sectarian literature, mainly their well known magazines The Watchtower and Awake! as well as endless copies of their tracts and the "New World Translation" of the Bible. Each of their 5.8 million members are expected to be part of their systematic and incessant visitation campaign, the key to their success, placing literature and acting as divine heralds to what they call "the Gospel of the Kingdom." Even in Tennessee, in the midst of the "Bible Belt," their visitation is quite extensive. In downtown urban Chattanooga, you will find them in pairs on streetcorners everywhere holding these magazines out before them, beckoning an audience. And no matter where you go, from hospital waiting rooms in Athens to laundromats in Dunlap, the same two publications can be found in circulation. Even in the vastness of rural Polk County here in Southeastern Tennessee, a land of rolling countryside, dense forest, and rugged Smoky Mountain ranges and foothills, they routinely visit each household every three months to place these magazines and herald their message. Many people, and surprisingly many churches, accept their books and commentaries as legitimate Biblical reference works. This is a microcosm of the Watchtower's global presence and influence. Their willingness to fight for their personal freedoms to preach their view of the Gospel, to spurn any association with individuals and institutions not allied with the Watchtower, and a continued public perception of their group as that of zealous Christians following a strict and moral lifestyle have earned for them a grudging respect in many quarters and the envy of frustrated pastors who cite their zeal as an example for their lackadaisical flocks to follow. Only the outreach of the Mormon Church's massive media campaign can compare to the Watchtower's ability to blanket an area with door to door publishers. The Watchtower, however, is finding it increasingly more difficult to win converts to their cause. A few years ago, it was estimated that Witnesses spent around 1500 hours to recruit a "study", or prospective member. That is an incredible amount of back calling, return visits and time spent on one person. But using their "service year" statistical information in the January 1, 1999 Watchtower, we have now learned that Witnesses had to spend - on average - more than 3700 hours to make a prospect a true believer, one ready to perpetuate their sectarian drive. This staggering figure translated to an annual growth rate of only 3.6 percent for the organization for 1998. But one thing seems clear. The Watchtower is finding that their field work is getting immeasurably more difficult and time consuming. Despite the daunting task they face, it is equally certain that the Watchtower will continue to deploy their Witness constituency throughout the world, even though no amount of their legendary spinning of the facts can hide their decline. What is the gospel that Jehovah's Witnesses stand for? Why are they considered to be a cultic group? Is their emphasis on divine direction through organization a sound Bible principle? What does the Bible say about the teachings of the Watchtower? We believe we offer an objective view on these questions, and that we will fairly represent their views by using actual Watchtower literature and documentation. What we shall shortly demonstrate is that there is ample evidence that the Watchtower's claim to divine authority is as unfounded as it is unbiblical, that its process of "making disciples" is both profoundly oppressive and deceptive, and that it is indeed a far cry from being "God's Visible Organization." Is the Watchtower A Cultic Organization? Does God Need An Organization? What Happened To The "Creator's Promise" On 1914? "Journals Of Truth" - The Bible Or "The Watchtower"?